The Department of Homeland Security and the Patriot Act will be discussed. What advance information was known and to whom. Discover how much pain and suffering might have been avoided if the separation and competition between the police and fire departments in New York City had been worked out over the years. Whether the attacks could have been prevented will never be discovered, but our country does need answers regarding the inattention of the military to external attacks on America. Our country clearly is not safe from terrorist attacks, nor can it be, given the realities of what that would take to accomplish. In the immediate aftermath of the attacks, President Bush blamed the terrorists of Afghanistan under the leadership of Osama bin Laden; today, his blame has morphed into an excuse to go to war against Saddam Hussein and the Iraqi people. September 11, 2001 had an enormous impact upon America, forever doing away with its historic sense of invulnerability and changing the manner in which it interacted with the rest of the world. The following paper will look at the various factors that led to the attack, focusing in particular on traditional U.S. foreign policy in the Middle East. From there, the paper will examine how the attack influenced American everyday living, from the suspension of habeas corpus, to the creation of the Department of Homeland Security, to the Patriot Act. In the final analysis, what should emerge is a realization that while the terrorists have not, and presumably will not, win this war, they have changed America profoundly, nonetheless. In the wake of September 11, 2001, numerous pundits asked urgent questions about what factors may have precipitated the attack. Leaving aside momentarily the obvious security lapses and intelligence-gathering oversights that permitted these individuals to execute their evil designs, one is well-served by examining U.S. foreign policy to see how that policy fanned the flames of anti-American sentiment in a part of the world still hostage to irrational hatreds and blind, theologically-driven dogmatism. Be that as it may, America is a victim of its own power, perverse as that may sound. European commentators frequently refer to the United States as a “hyper-power” and when this relative omnipotence is perceived as a threat in parts of the world where religious fundamentalism, cultural monism and reactionaryism prevail, then the likelihood that the disenchanted and dispossessed will act out violently is heightened considerably. In seeking out the roots of this hatred, it is worthwhile to travel back at least to the early years of the Post World War II epoch, for the sort of hatred the world saw on 9/11 was a product of festering bitterness dating back many decades – if not generations. European commentators have long charged that the U.S. is an “imperial” power exerting enormous control over international governing bodies and institutions – institutions, it should be added, that bear an indelibly American stamp. This hegemonic relationship is complicated by the fact that America is also a putative republic and that status as a republic would seem to reject imperialist ambitions. Anti-American sentiment is exacerbated by the sense that America is claiming one to be one thing, acting like another, and – in the case of the Middle East – using its enormous power to bolster an Israeli state that is loathed by many Muslims in the region. Within the Arab world, it is reasonable to infer that a great deal of the anger directed toward America exists because too many individuals in that part of the world believe America holds the Arab world in contempt. For instance, in the wake of the Second World War, the Bretton Woods economic agreements – spearheaded by America – and the Marshall Plan (noble though it was) were animated throughout by a vision of a “free” world dominated by North America (principally America), Western Europe and Japan; quite simply, the Middle East simply did not figure in the equation. Every bit as importantly, the dynamics of the Cold War necessitated that American foreign policy interpret international events through the prism of its ongoing battle with the Soviet Union. Needless to say, geo-political considerations often meant America was compelled to support “friendly” dictators or roughly intervene in areas where it perceived a Communist threat to its interests. With the collapse of the Soviet Union, America no longer had to engage in super-power politics, but it was placed in the position of being the world’s one great military and economic superpower – and the world’s fearsome sheriff seeing to it that international law and order were obeyed. Suffice it to say, when George W. Bush took power, his aggressive foreign policy and the unwillingness of he and his advisors to accept multi-lateral accords that the Clinton White House had been content to endorse (if not sign) revived anti-American sentiment around the globe. When one couples this assertive stance with the stark reality that so many international bodies are controlled by America, it is easy to see why individuals from Middle Eastern countries, vigorously objecting to what they perceive to be the moral decadence and ‘godlessness” of America, have been aroused sufficiently to commit acts of great evil. Clearly, it is American power and the ideals and attitudes that ultimately inform the exercise of that power, that terrify many who have a diametrically opposed view of social and cultural issues. All of the above tells us much, but not all, of the story. While it can be over-stated, America’s role in the Middle East post World War II has often been one of thwarting the nationalist will of Arab states bearing large oil reserves. For example, the U.S. efforts to control the Middle East invariably led to the building-up of Iran and Israel as regionally powerful gendarmies beholden to the United States; In addition, the imperatives of U.S. policy also dictated the dispensation of vital aid to Jordan, Kuwait and Syria in return for concessions and “good behavior”. While keeping the Arabs firmly in line with a “carrot and stick” approach, the U.S. also displayed, in the aftermath of World War II, a willingness to step on the toes of the British and other Old-World powers still presumptuous enough to believe they had a say in the oil-rich region. To sum it all up then, U.S. foreign policy in the last half of the twentieth century can be most accurately described as one in which oil interests were to be safeguarded by any feasible means – including “strong-arming” states which refused to play ball with the American colossus. If the Americans used their new-found ascendancy in the Post World War II era to stake a claim to the Middle East, then the hubris arising from such power emboldened them to take further steps to browbeat their rivals – such as they were – and to consolidate control over the world’s most enormous supply of oil. Michael Tucker has written that American policies after the Second World War were designed to oppose any nationalist fervor or nationalist uprisings that might create the sort of instability inimical to American interests. During the Lebanese crisis of 1958, the United States roughly intervened to quell nationalist uprisings. According to then U.S. Secretary of State, John Foster Dulles, the United States policy of the time was to be one “regard(ing) Arab nationalism as a flood which is running strongly. We cannot successfully oppose it, but we could put sand bags around positions we must protect – the first group being Israel and Lebanon and the second being the oil positions around the Persian Gulf”. This approach was certainly in keeping with American foreign policy at the time, as the United States had crippled the Iranian economy (through the suspension of much-needed financial aid) in the early 1950s when the latter was perceived as being too nationalistic and concomitantly “anti-western”. Later, in the 1960s and 1970s, the United States would apply “pressure” upon various Arab nations that were outraged about Israeli expansionism and eager to lash back in any manner possible. The point to all of this is that Arab states felt themselves to be constrained by American power, told who to sell their oil to and to what extent, pressured to pick their friends according to the needs of Washington and compelled, by the ominous threat of American military force, to mostly endure in silence a Jewish state most of them bitterly opposed. When one factors in the jarring juxtaposition between the wealth of American oil companies and the corresponding squalor and poverty of much of the Arab world, it is easy to see why ordinary citizens, let along their governments, cried out for vengeance against the United States – whether this bloodthirsty feeling was rational or not. All of this brings us to the situation in Afghanistan. Without question, the story of American involvement in Afghanistan has been told many times; however, it is fair to conclude that the true extent of that involvement has rarely been revealed. While the author of this paper can make no claim to knowing the full scope of the curious quarter-century long American misadventures in Afghanistan, it can reveal at least part of the historical narrative. According to one leading expert, the United States had engaged in covert operations in Iraq since at least the late 1970s when it became apparent that the Soviet Union was losing its hold on power in a nation that has never been known for its congeniality towards foreign dominators. When the Soviets were finally compelled to invade Afghanistan in 1979, the U.S. CIA infiltrated Afghanistan and began covert operations. These covert operations involved priming violent Afghan factions with cash and weapons, secretly establishing and training murderous guerilla forces, funding anti-Soviet propaganda (although it must be asked if Afghan citizens exposed to such propaganda were impressed by it at all or simply conflated the unwelcome Americans with the hated Soviets), and most especially of all, manipulating domestic politics. It was in this violent milieu that Osama Bin Laden first conceived and then built his global organization. Thus, at the very least, the United States provided the rabidly fundamentalist Bin Laden with the tools and expertise he needed to wage war against foreign usurpers and infidels. As for why he turned on his former mentor, it is perhaps safest to conclude that Bin Laden’s ugly campaign against America was the brain-child of a megalomaniacal religious zealot with designs on reviving Muslim strength and virility after generations of being emasculated by powerful western states. Whatever the underlying motives for the barbarity of Al-Qaeda, it is an indubitable fact that Bin Laden’s minions have changed American life profoundly, possibly ineradicably. The controversial Patriot Act has stirred strong reactions on both sides of the ideological divide in America. Under the provisions of the Act, providers of wiretaps are granted immunity against prosecution; every bit as meaningfully, the statute strengthens automated finger-printing procedures at entry points throughout America and provides for a nation-wide monitoring program of foreign-born students. Provision 213 of the Act also permits authorities to engage in “surreptitious search warrants and seizures upon a showing of ‘reasonable necessity’ and eliminates the requirement of Rule 41 of the Federal Rules of Criminal Procedure that immediate notification of seized items be provided”. Simply put, the Patriot Act creates an environment whereby citizens find their security against improper search and seizure (potentially) greatly curtailed; in addition, those who set up wiretaps surreptitiously so as to monitor other Americans can do so unimpeded by the threat of federal prosecution. As a result, the post-9/11 America is one that is less free, less conscientious about protecting human rights – and less willing to protect its private citizens from invasive police procedures. Whether or not this will continue indefinitely is impossible to say – but that is the position America finds itself in a little less than four years after the World Trade Center attacks. 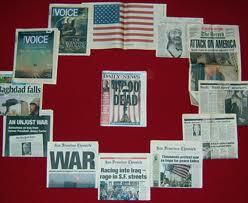 The events of September 11, 2001, have affected America in other ways, as well. Since that tragic day, the U.S. Justice Department has staunchly insisted that it can apprehend and persecute suspected terrorists without granting unto them their constitutionally enumerated rights of due process – one of those rights being habeas corpus. Needless to say, Guantanamo Bay has become a symbolic battleground between civil libertarians and defenders of the security measures passed under the Bush Administration. More than just the fact that authorities can seize suspects in a very unceremonious and abrupt manner, left-of-center critics such as Hornberger also point out that the precedent established at Guantanamo opens the door for other suspects to be tried “expeditiously” before military as opposed to civilian courts. Such a development also seems a threat to procedural rights and civil liberties in America and has been roundly denounced in many circles. Ultimately, what seems evident is that America is moving towards a more authoritarian period in its history as elites struggle to contain the threat terrorism poses. Incidentally, the massive proliferation and broad powers enjoyed by the Department of Homeland Security seems a precursor to more state involvement in the everyday lives of citizens, as well. To sum it all up, individual rights – at least for the time being – are to be subordinated to the collective needs of a nation that finds itself under pressing threat of attack. In closing briefly, it may be said that the events of Septemeber 11, 2005 changed America in ways that would have been unimaginable only a few years ago. The preceding paper has looked at some of these changes – the Patriot Act, the suspension of Habeas Corpus in extreme cases, the emergence of the Department of Homeland Security – and also examined the U.S. policy decisions that (may have) sparked the attacks and the unfortunate rise of a terrorist organization like Al-Qaeda. In the final analysis, America will continue to undergo change in the future (there is, for instance, no guarantee that the measures in place now will be in place even a generation from now) but it evident that a new period in America’s history unfolded on an otherwise pristine September day a little less than three years ago. Post-War U.S. Economic Policies research papers look at the break-up of the Bretton Woods system and the current state of several key countries such as Japan. Iraq and the Cold War research papers account how the Soviet Union influenced the political leader Saddam Hussein. Transportation Security Administration research papers look into the agency of the U.S. Department of Homeland Security that was created in the wake of 9/11 in order to protect air travel and airports in the United States. Paper Masters writes custom research papers on The Socio-Political Factors of 911 and discuss what the terrorist attack did to the United States sociologically.